Many choose to call this special night “The Oscars of the PR Industry” and rightfully so. Now in their 19th year, the PR Week Awards celebrates the best of the best corporate, agency, nonprofit and education teams for the work they produced during the previous year. The annual gala showcases a tremendous diversity of work and underlines why we should be enthusiastic about the future impact of PR on business, issues, governance and movements alike. 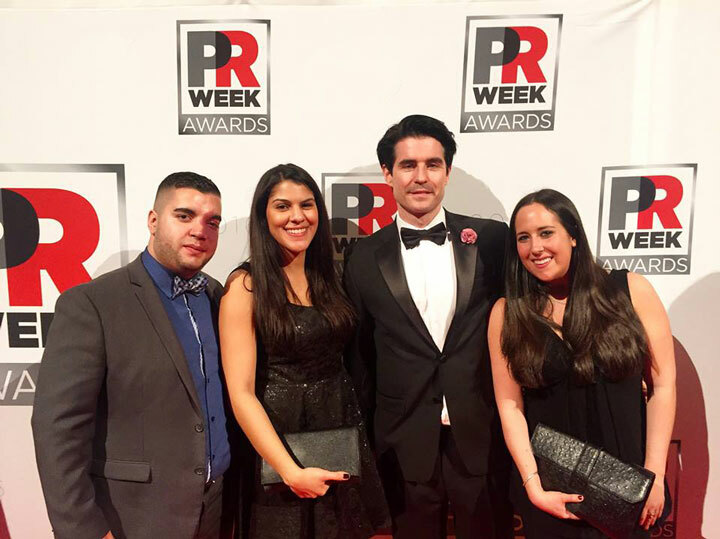 As a boutique recruitment firm for the public relations and communications industry we are obliged to remain highly connected with the industry; attending the PR Week Awards feels far from an obligation however. We happily attend every year. We love seeing our clients and candidates nominated and recognized for their innovative skills and flair. It’s crucial we understand where PR is heading, industry trends and issues, and to continue to support and build greater depth of relationships. The PR Week Awards is our favorite night to catch up with professionals we’ve worked with and/or aspire to support one day. Held at The Cipriani in NYC, the event is nothing short of spectacular. The décor, lights, food, beverages and audience capture the beauty and future of PR. The night begins with a cocktail hour to help professionals and friends mix and mingle while sipping on a glass of champagne after a long day at the office. You are constantly invited to try yummy appetizers as the waiters walk out with beautifully arranged trays. As the hour ends, it’s time for dinner and the awards show in the main hall. As the charismatic host introduces the awards and winner’s, guests are treated to delicious wine, a tasty salad and an impeccable filet mignon. Being able to witness the very best examples of strategy and creativity in PR be recognized and celebrated, is genuinely an honor. With only 39 trophies to award, the competition is intense. Winners of the PR Week Awards demonstrated the extent of expertise, originality and talent in the PR industry nation wide. The 2018 Communicator of the Year was awarded to Tarana Burke, the #MeToo movement catalyst. In an effort to help young survivors of sexual assault know that they are not alone she has created an immense network for women to feel safe to speak up and create change in the world. The Outstanding Education Program went to Depaul University and the prestigious Campaign of the Year was granted to Frito-Lay North America and Ketchum for their work on the Tostitos Party Safe Bag. Weber Shandwick was granted the honor of winning two highly sought after awards: Outstanding Large Agency and Agency of the Year. C+C was recognized as the top Outstanding Small Agency and Olson Engage as the top Midsize Agency. At this year’s awards, young jurists were brought in which has added a fresh point of view to mix in with PR Week’s more seasoned participants. As the host sung the night away, we reflected on all the winners and the impact of PR in the past year. Movements such as #MeToo that started out of nowhere have the chance to be heard and celebrated around the world. The PR Week Awards give small and large businesses, universities and organizations, the chance to innovate and create while being recognized and celebrated. It is the chance to showcase achievements and highlight the best in the industry. We will always choose to attend the dazzling “Oscars of the PR Industry” and be proud to recognize, congratulate and admire all nominees and winners.